Left: Michigan. Schools probably opened. 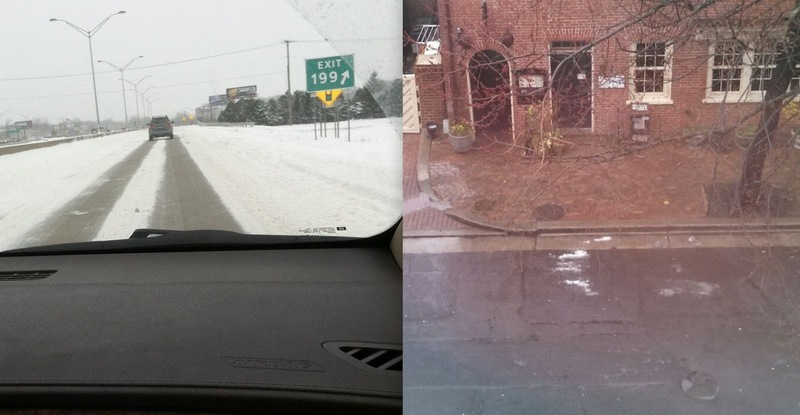 Right: Alexandria, VA. Schools & the federal government closed. After being born and raised in Michigan, moving to the D.C. area over a decade ago was not too much of a culture shock. The biggest adjustment to me, besides the cost of living, was the area's overreaction to rain or snow. It is a little unnerving that the capital of the most powerful nation in the world panics whenever bad weather passes through. When it rains, it is not unusual to see cars camped out under freeway overpasses waiting for the rain to stop...and I'm not even talking monsoon rain, just your average rainstorm. I happily drive on, knowing that my car is getting a much-needed wash. When snow is FORECASTED, the town pretty much shuts down, even if the forecast only projects 1 to 2 inches. People rush to the supermarkets, fearful that they might be without milk or produce for weeks, and the federal and local governments and schools announce closings the night before...just in case it snows. I could understand this reaction if our nation's capital were located somewhere it rarely snows, like Florida, but it does snow here...EVERY YEAR. At some point the nation's capital needs to toughen up. We have plows and salt trucks for the major roads, and they successfully clear all but blizzard conditions from the roads. At some point, this region needs to figure out what kind of snowfall requires closures, and the citizens of this metropolitan region need to learn how to drive in bad weather (including rain). January 20 through 23 of this year was the perfect example of the ridiculousness of this area's snow panic. "Due to the expected snow storm, all schools and offices will be closed on Tuesday, Jan. 21, 2014." EXPECTED snow storm? I visit the major online weather sites and see that a "snow storm" means only 3 to 6 inches of snow over the period of 12 to 14 hours. Not only that, but the snow is not even supposed to start until 8 or 9 in the morning, in other words, after the kids would be safely in their classrooms. 5:45 a.m. Tuesday: Not a flake has fallen. My wife informs me that the federal government has shut down too. We go back to sleep. Russia must be laughing at us. 8:00 a.m.: Again, no snow. The streets are clear, and the sidewalks are not icy. A morning commute would have been as ordinary as any weekday, but we must keep the kids home today because it probably will snow. 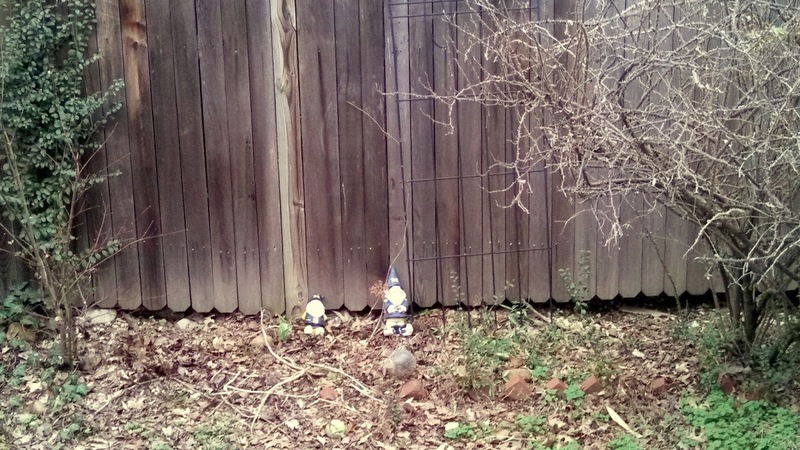 I look at my backyard garden gnomes and fear for their safety, but should I be brave enough to venture outside? After all, an avalanche of snowflakes could bury me before I escape the confines of my backyard. 10:00 a.m. 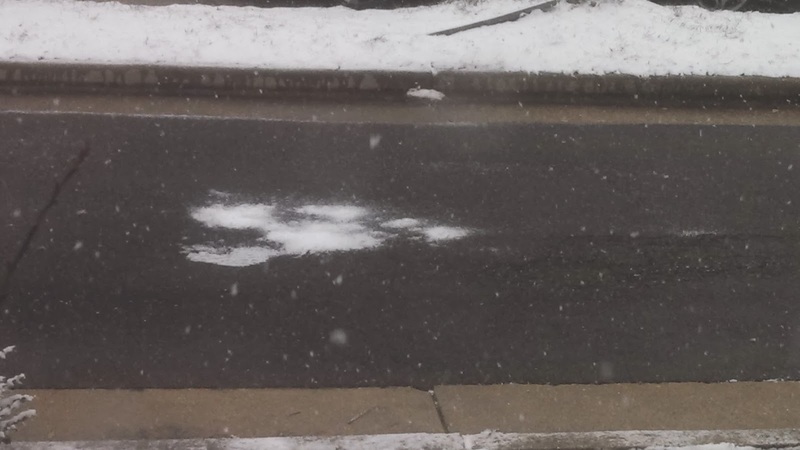 The snow has started to lightly fall upon the ground. The local kids could have been in school for two hours. The only danger to the children would have been the possibility of one of them tripping while excitedly running to his classroom window to look outside at the snow. 12:00 p.m. 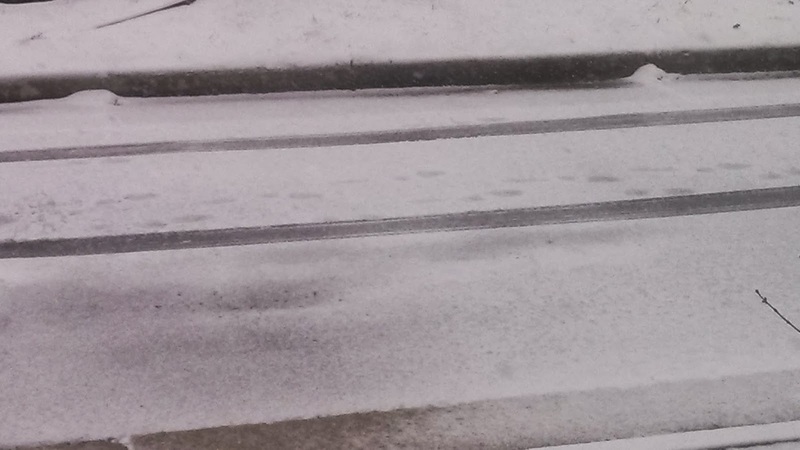 The snow has lightly covered the ground. The sidewalks and roads are absolutely clear. The terror of living in Metro D.C.
2:30 p.m. The snow is finally sticking to the road. Driving on this would require some smarter driving, but these roads are by no means dangerous. The road outside my house at 2:30. Still very drivable. And they did. And then they opened two hours late on Thursday (despite the fact that it had not snowed since Tuesday and the roads and sidewalks were pretty clear). My daughter already had a half day scheduled on Thursday, so she got about an hour and a half of education that day. The gnomes survived, in case you were wondering. The Best Day to Be in D.C. I realized last week that Martin Luther King Jr. Day is my favorite day to be in D.C. The weather might be cold, but otherwise, it’s perfect. Granted, I am fascinated by the Civil Rights movement. When the 50th anniversary of the March on Washington came around last August, I went with my older daughter and my mom. We stood on the steps of the Lincoln Memorial where King stood when he delivered his “I Have a Dream” speech and visited the MLK memorial. Ten years earlier, my mom and I also took the Metro into D.C. for the 40th anniversary (and a teeny tiny picture of me was in the Washington Post article about the event). But even if I weren’t so interested, MLK Day is unique. It’s exciting to be in D.C. on many days that draw tourists. There is always something happening here--holidays to celebrate and events to attend, including the 4th of July and the cherry blossom festival. But D.C. can be a hostile place. Just the fact that the government is here makes it kind of contentious—someone is always unhappy, and there are naysayers about everything. And protests (and counterprotests) about everything. Those of us who live and work here know that we often have to change our plans when there’s a protest. Not to diminish protesters—they march or gather to support whatever they think is right, which I respect and which I have also taken part in. But to be in D.C. when a crowd has gathered only to celebrate something is a totally different experience. On MLK Day, Jeff and I took our daughters and headed to the Lincoln Memorial first, but our route crossed the Vietnam and Korean war memorials, and they are impossible to ignore—too powerful to walk by without pausing. We gave a brief, kindergarten-appropriate lesson and walked over to the Lincoln, which was bustling with people talking, laughing, and taking each other’s pictures. I guess that might describe the typical crowd there, but I think most of them were probably there because of the day’s significance, not just because their tourist trip or walk down the mall happened to coincide with MLK Day. There is now an engraving on one of the steps that marks the spot where King stood when he gave his famous speech. On MLK Day, people had to wait their turn to stand there and take pictures, and someone had thoughtfully poured water on the engraving so you could see it better. My kindergartener is too young to realize how exciting it is that she stood exactly where MLK stood when he spoke words that people would remember forever—but she understands a little of the history, and I love knowing that I am instilling in my daughters respect and appreciation for one of our country’s greatest historical figures. The crowd at the MLK memorial was even more celebratory. People had obviously taken trips to D.C. for the sole purpose of being here for that day—they held up banners commemorating the event, and many of them were parents who brought their kids, like we did. I loved seeing the people who were there together and wondered what they’d say to each other about the experience. To me, the MLK memorial would be impressive even if it consisted only of his words etched in some granite. (I continue to be awed by his words, and his Letter From a Birmingham Jail is one of the most powerful things I've ever read. To think he scrawled it in the margins of a newspaper.) But the memorial gives space to both his words and a statute of him that aptly represents what is carved on the side of the monument: out of a mountain of depair, a stone of hope. On the way back to the car, we stopped at the World War II Memorial. It is grander in warmer weather when the water in the fountains is turned on, but it is grand nonetheless. It is in between the Lincoln and the Washington monuments, and you can see both from it easily. 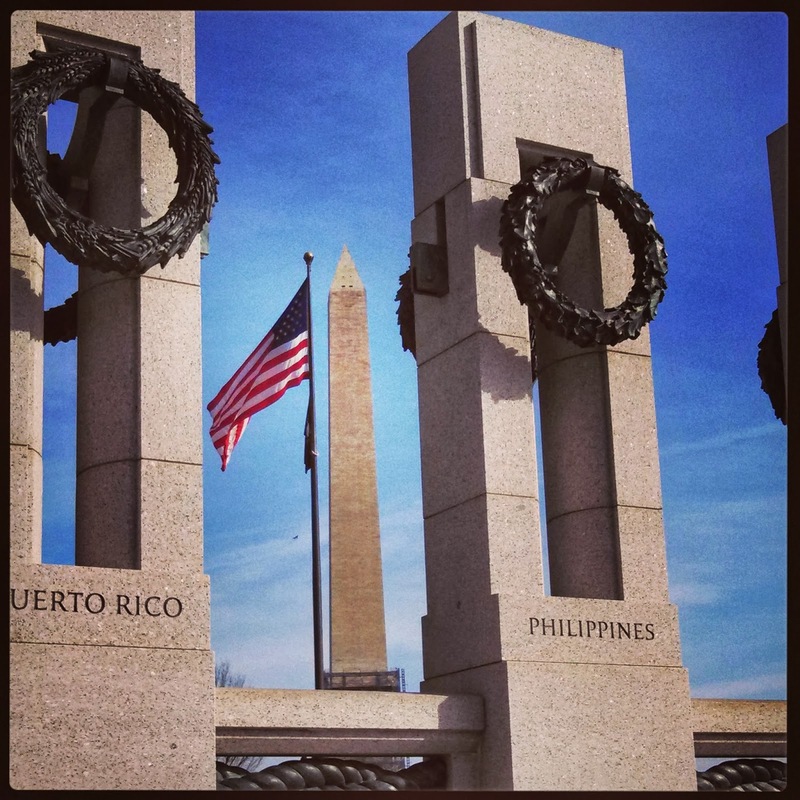 Jeff stopped at the Michigan column and talked to our daughter about it; I lingered at the Philippines column and thought about how my Filipino grandfather’s decision to join the Army and serve in WWII, and then become a U.S. citizen, got me to where I was standing. He is my paternal grandfather; my maternal great-grandfather was also from the Philippines and became a U.S. citizen through joining the armed forces. History is important for many reasons. On MLK Day, I always think of how different the world was before the Civil Rights movement—it’s hard for me to believe my parents experienced that world—and I am thankful for King and the other leaders who made those changes happen so that my world is what it is. 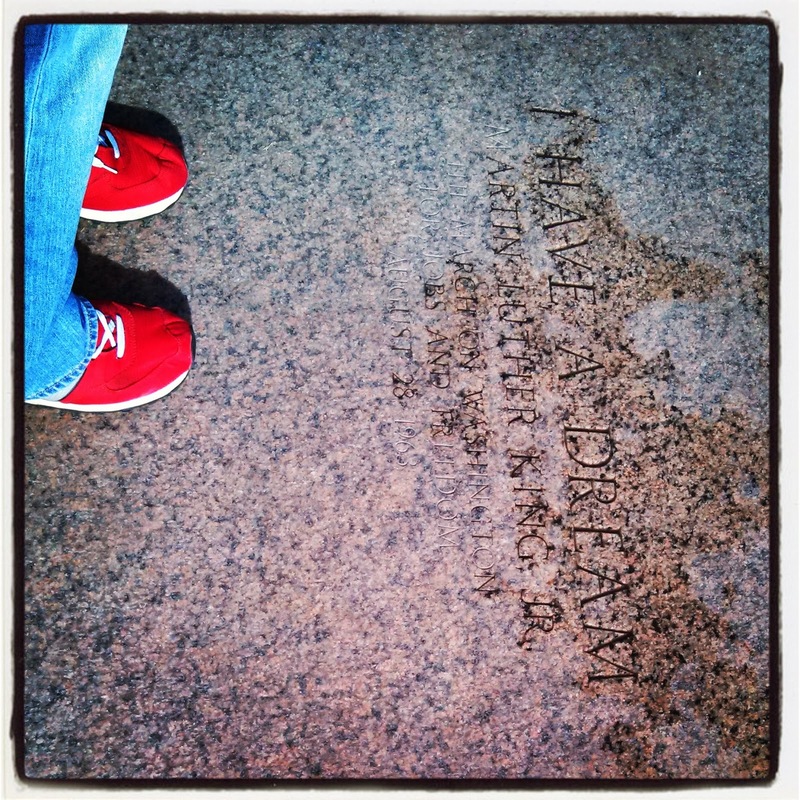 And I wasn’t the only person in D.C. that day celebrating history and pondering my place in it. We wanted to call this blog “Say ‘what?’ again!! !” but decided against it, because only people who have seen Pulp Fiction multiple times would get it. Others would assume we meant “Say what, again?” and we wouldn’t want that. The name of the blog came about because there are lots of things we like to read, listen to, and watch—and talk and write about. We both write in other contexts, but we want this blog to be a place where the words can flow freely, without being tied to any specific subject matter. Life is too short not to say what’s on your mind and not to enjoy what’s around you. We encourage each other to do both. Something Lewis Thomas wrote in The Medusa and the Snail sums up why we think it’s important to express opinions. "We pass the word around; we ponder how the case is put by different people; we read the poetry; we meditate over the literature; we play the music; we change our minds; we reach an understanding. Society evolves this way, not by shouting each other down, but by the unique capacity of unique, individual human beings to comprehend each other." We can’t promise we’ll never shout. An occasional rant is necessary. Sometimes we may even use ALL CAPS, but never for more than a phrase at a time. No one wants to read that.